A long standing customer of KK Balers had been struggling with their increased turn-over of packaging materials. The KK 40 was installed initially which for a few years was sufficiently managing the waste stream, but with the volume building as their business increased they needed to upgrade to a larger model, the KK 500 in this instance. Dermalogica is the number one choice of skin care professionals and consumers worldwide. Established for over 25 years, they are dedicated to delivering skin health results through education, innovation, and professional recommendation. KK are pleased to work with Dermalogica having managed their waste disposal system for 13 years. Used boxes and cardboard waste can soon build up and use up a lot of storage space. It can also become costly to get rid of these boxes in their original form. 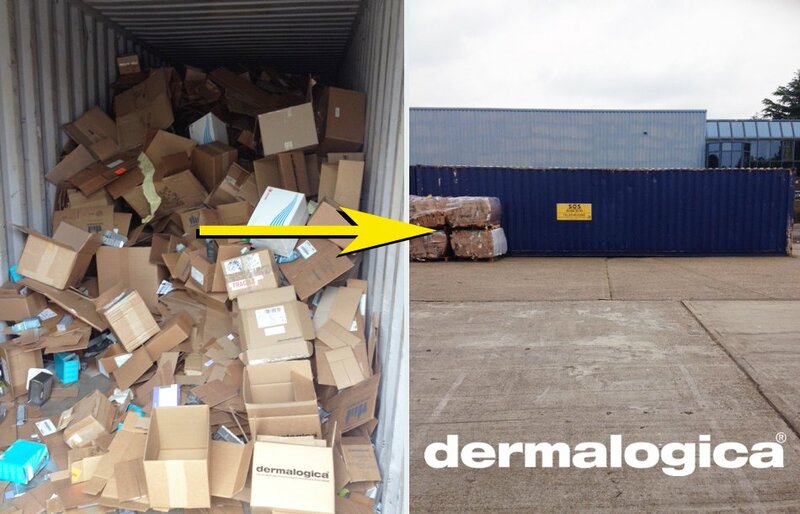 Dermalogica filled a 40ft container to about three quarters with un-compacted cardboard waste. Within a few days of having a new KK 500 installed they turned the boxes into four mill-size bales which will receive revenue upon collection & saved container collection costs.